Commercial port of Dalmatia, and a city of note since the days of the Roman empire. 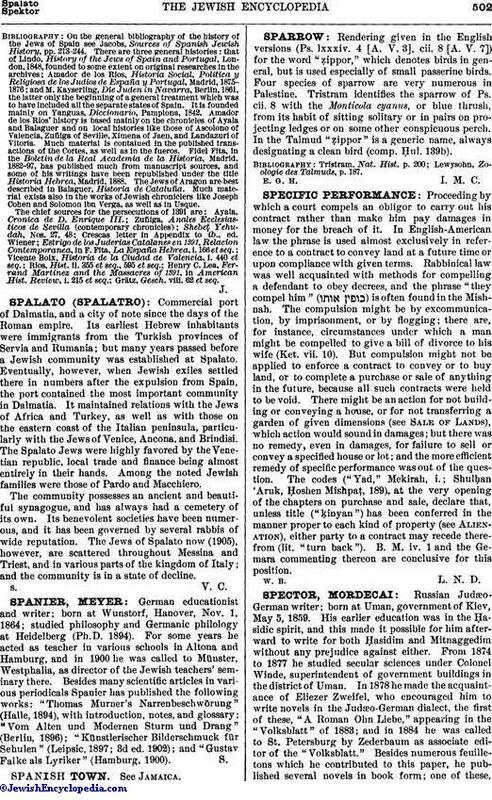 Its earliest Hebrew inhabitants were immigrants from the Turkish provinces of Servia and Rumania; but many years passed before a Jewish community was established at Spalato. Eventually, however, when Jewish exiles settled there in numbers after the expulsion from Spain, the port contained the most important community in Dalmatia. It maintained relations with the Jews of Africa and Turkey, as well as with those on the eastern coast of the Italian peninsula, particularly with the Jews of Venice, Ancona, and Brindisi. The Spalato Jews were highly favored by the Venetian republic, local trade and finance being almost entirely in their hands. Among the noted Jewish families were those of Pardo and Macchiero. The community possesses an ancient and beautiful synagogue, and has always had a cemetery of its own. Its benevolent societies have been numerous, and it has been governed by several rabbis of wide reputation. The Jews of Spalato now (1905), however, are scattered throughout Messina and Triest, and in various parts of the kingdom of Italy; and the community is in a state of decline.